In general, dental clinical trials are looking for participants who are otherwise healthy and who do not use tobacco products or other drugs. A lot is known about how to diagnose and treat dental problems, but there are always ongoing dental clinical trials to learn better and more efficient ways of treating dental pain and ailments. If you have struggled with long-term dental problems or have healthy teeth and are interested in possibly participating in a dental clinical trial, please review our list of current trials. Dental is a term that refers to an area of medicine that specializes in treating people’s teeth and mouths. People who work in the dental field include dentists, oral surgeons, orthodontists, nurses, and dental assistants. The dental field treats common problems with teeth such as dental pain, tooth extractions and gum disease. Orthodontists specialize in dental treatments that usually involve the bone. They are probably most commonly known as the person you go to see when you need braces to straighten your teeth. The dental industry is very big on advocating prevention as the best dental treatment. Regular brushing of the teeth, flossing and regular check-ups with a dentist can prevent many of the common problems that dentists see. Common surgical dental treatments include root canals and removal of the wisdom teeth. Root canals are areas of the tooth that become infected. Wisdom teeth are teeth that grow in the back of our mouths that often come in sideways. Since we don’t really need our wisdom teeth, dentists often just remove them to prevent any problems. 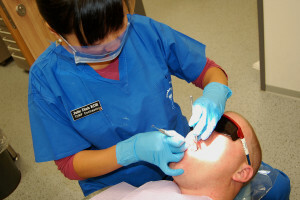 Routine dental treatments include crowns (caps), veneers, bridges, and dentures. All of these are different ways of dealing with damaged, lost, missing or rotten teeth that need to be replaced. Dentists also deal with purely aesthetic treatments such as teeth whitening. Amnion-Chorion Allograft Barrier Used for Root Surface and Guided Tissue Regeneration for Periodontal Intrabony Defects and Grade II Furcation Defects.